A group of Wildcats convene after a point. Northwestern travels to the state of Michigan for two games this weekend as it tries to breathe life into a difficult season to date. Time is running out for Northwestern to turn things around. The Wildcats (8-16, 1-11 Big Ten) face a two-game road trip to the state of Michigan this weekend, taking on No. 16 Michigan State (19-5, 8-4) on Friday and No. 17 Michigan (18-6, 7-5) on Saturday. Although NU will play two ranked teams on consecutive nights, it represents the easier part of the next two weeks. The Cats will come back from the road trip and take on No. 2 Minnesota and No. 3 Wisconsin next weekend. Junior setter Taylor Tashima said playing on the road takes an added layer of focus, especially for freshmen such as libero Sarah Johnson. NU will have to lean on Johnson and the rest of its passers Friday night in East Lansing. The Spartans lead the Big Ten with a whopping 2.06 aces per set. No other Big Ten team has more than 1.67. Michigan State also a boasts a balanced offensive attack, with two hitters in the top five in the Big Ten in hitting percentage. Tashima said the key to beating the Wolverines on Saturday night will be slowing down senior middle blocker Abby Cole. The Cats might also have a tough time scoring, as Michigan sophomore libero Jenna Lerg ranks first in the Big Ten with 4.38 digs per set. 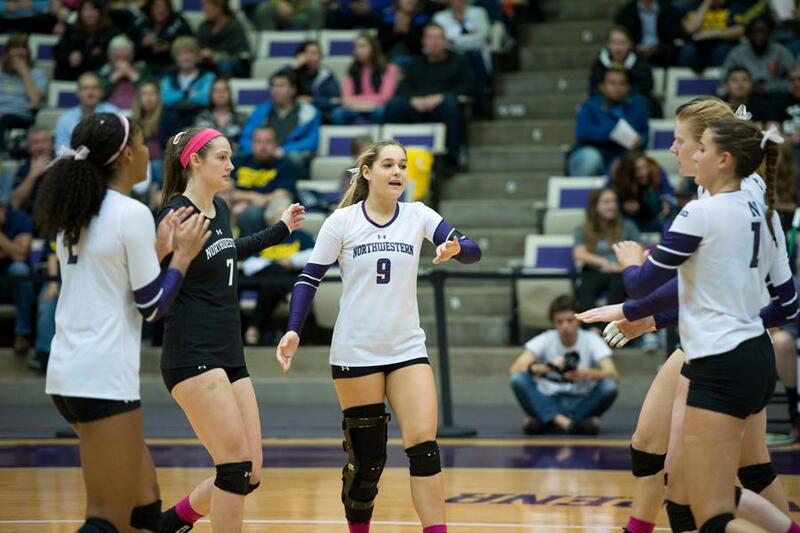 NU fell to the Wolverines 25-17, 25-18, 25-13 back on Oct. 12 in Evanston. Junior middle blocker Gabrielle Hazen said the Cats are looking to avenge that loss. Coach Shane Davis said NU needs to get production out of the libero and defensive specialist positions. He added the Cats will likely continue to lean on Hazen and junior outside hitter Symone Abbott, who ranks fifth in the Big Ten with 3.88 kills per set. Abbott’s 326 kills this season are more than the next two players, Hazen and senior middle blocker Maddie Slater, combined. Davis said although the Cats haven’t had the most successful season, he’s seen improvement. He said NU has to be better closing out sets, pointing to last weekend’s game at Iowa when the Cats blew a 22-18 lead to lose the set 25-22. Hazen said NU continues to grow as a team, and the key to winning is for everyone to do their part. “We can all just be one point better, and that adds up,” Hazen said.